I generally don’t blog about abortion rights. 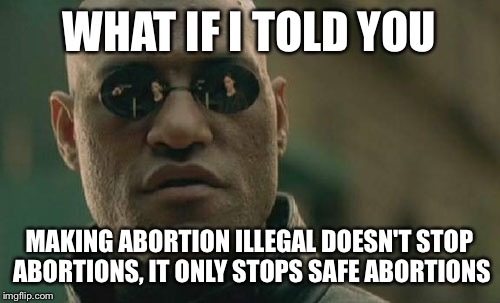 I find abortion to be a stupid thing to be used for birth control, but sometimes it’s the only option and it’s everyone’s right to control their own body and choose the healthcare that they want. Of course, some people don’t think that’s so. They think it is their right to control people. Why yes, Dave, we pro-choice people care about every woman’s choice and *especially* those who are the vulnerable people you mention. If you want to force your choices on others, then yep, you are a theocrat who doesn’t care about these people. You only want external validation. You don’t want to help women or children or families. You want people to risk dying for *your* religion. Is it your right to tell someone what they can do with their body? Explain why. Do you want to help support these children and families with everything from good nutrition, good education, safe housing, counseling, etc? If not, then why do you think you can force someone to have a child? You are not pro-life, you are pro-birth and pro-control. Do you support other means of birth control? If not, you’re the problem. How many children have you adopted/fostered? If you haven’t, why not? Do you think you can force someone to risk their lives? Why? Any pregnancy can go wrong. One has to wonder why Christians with their supposed healing powers can do nothing for these women. I welcome any anti-choice person’s reply. I suspect I won’t get any. There is not one thing that shows that allowing abortion somehow ends medical progress. IF there is, it would be nice to be shown some evidence. Until that happens, it’s a shame that again a Christian has to lie to try to force his beliefs on others. Bugger, he doesn’t have a comments section. Shame, because I quite enjoy a good abortion debate. Making fun of the absurdity of it lightens the mood. Then you might like this chap, JZ …. yes, because he is a coward who doesn’t want to be shown wrong. So much for the armor of god, eh? I feel that abortion is murder. Pregnancy is almost 100% preventable. In the rare cases a mother’s life is at risk termination of pregnancy is a decision that the people involved need to make. Personally if my child would likely survive I may choose to let them have a chance at life even if my husband might disagree. I think you would have a very hard time finding a doctor willing to let a mother die if the child had less of a chance of survival. When I was in the process of losing my first child my doctor nearly demanded I induce labor to reduce risk of infection. Thankfully I didn’t have to make that decision and labor started on its own. I didn’t want to give up on my child. So, Tracy, are you for women getting birth control of other types? And yes, when the mother’s life is at stake, then people involved do need to make it, not you and not politicians. That is the case for any abortion. It’s not your decision. It is curious that you would put the guilt of your death on your child. And yes, it would likely be hard to find a doctor who would be willing to allow a human being to die to allow a potential human being to live. You made your choice in ignoring the physician. Now you want to force your choice on others. That’s is not your right.